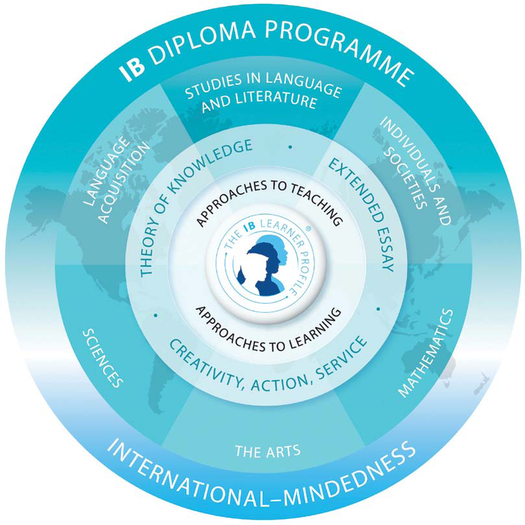 The International Baccalaureate Diploma Program (IB DP) is an academically and personally challenging two-year pre-university course. It is designed to provide students of different linguistic, cultural and educational backgrounds with the intellectual, social and critical perspectives necessary for the adult world that lies ahead. It is highly respected by schools and universities throughout the world. One of its greatest strengths is its independence from politically-motivated interference by any national government. For more see at http://www.ibo.org/press/index.cfm. The DP is a high-quality educational program designed and monitored by educationalists with the aim of encouraging international awareness. The DP involves choosing three subjects to study in detail at higher level (HL) and three subjects at standard level (SL). HL courses represent 240 teaching hours, and require a greater depth of study across a broader range of content in the subject. SL courses require 150 hours and provide breadth of study across the whole Diploma Programme. All subjects are available at both HL and SL and are taught and examined in English. The core of the model consists of the Theory of Knowledge (TOK) course, the extended essay, and creativity, action, service (CAS). The interdisciplinary TOK course explores the relationship between the disciplines, and ensures that students engage in critical reflection about knowledge and experience acquired both within and beyond the classroom. The Extended Essay, with a prescribed limit of 4,000 words, offers the opportunity to investigate a topic of individual interest, and acquaints students with the independent research and writing skills expected at tertiary level. Participation in the school’s CAS programme encourages students to be involved in artistic pursuits, sports and community service work, thus fostering their awareness and appreciation of life outside the academic arena. Both ‘Literature’ and ‘Language and Literature’ are offered in Greek and in English. Group 2 - Language Acquisition (foreign language); English B is automatically on offer. French B & German B are offered upon sufficient enrollment too. Visual Arts; alternatively students at our school may select a second subject from one of Groups 2 to 4. The combination of subjects and requirements is a deliberate compromise between the preference for specialization in some countries and the emphasis on breadth often preferred in others. The intent is that students learn how to learn, analyze and reach considered conclusions about man, our languages and literature, our ways in society, and the scientific forces of our global environment. Within this model, students are able to explore some subjects in depth and some more broadly over the two-year period. All DP courses have work externally assessed by examination and internally assessed work that is externally moderated. The proportion of the final grade determined by internally assessed coursework and final examination varies amongst subjects. Theory of Knowledge The Theory of Knowledge (TOK) requirement is central to the educational philosophy of the Diploma Programme. It offers students and their teachers the opportunity to reflect critically on diverse ways of knowing and on areas of knowledge, and to consider the role and nature of knowledge in their own culture, in the cultures of others and in the wider world. It prompts students’ awareness of themselves as thinkers, encouraging them to become more acquainted with the complexity of knowledge and to recognize the need to act responsibly in an increasingly interconnected but uncertain world. As a thoughtful and purposeful inquiry into different ways of knowing, and into different kinds of knowledge, TOK is composed almost entirely of questions. The most central of these questions is “How do we know?” The critical reflection encouraged in students is a foundation for developing international awareness. All subjects around the hexagon aim to encourage in all students an appreciation and understanding of cultures and attitudes other than their own, but in this particular respect, TOK has a special role to play. It is a stated aim of TOK that students should become aware of the interpretative nature of knowledge, including personal and ideological biases, regardless of whether, ultimately, these biases are retained, revised or rejected. Students are required to demonstrate an awareness of the values and the limitations of their individual outlooks, and of the views common to the communities and cultures to which they belong. In coming to understand the strengths and limitations of their own and others’ cultural perspectives, students are better able to evaluate their own views and their own level of intercultural understanding. TOK also has an important role to play in providing coherence for a student’s Diploma Programme. Exploration of the nature of knowledge in TOK transcends and links academic subject areas, demonstrating for students the ways in which they can apply their own knowledge with greater awareness and credibility. The Extended Essay A required component, the extended essay is an independent, self-directed piece of research, culminating in a 4,000-word paper. It is given much importance by students, teachers and universities, because it provides practical preparation for the kinds of undergraduate research required at tertiary level. From the choice of a suitable research question, to the final completion of the extended essay, students must produce their piece within the constraints of time, essay length and available resources. This component provides an opportunity to engage in an in-depth study of a topic of interest within a chosen subject. Emphasis is placed on the research process, on the appropriate formulation of a research question, on personal engagement in the exploration of the topic, and on communication of ideas and development of argument. It develops the capacity to analyse, synthesize and evaluate knowledge, with a personal choice of topic from within any subject area. Students are supported and encouraged throughout the research and writing with advice and guidance from a supervisor. Στοιχεία Κασσιανισμου και Τυρταισμου στο Ποίημα «Εκατό Φωνές» του Κωστή Παλαμά. Ύστερες Ρομαντικές Στιγμές στην Νεοελληνική Λογοτεχνία Γ. Βιζυηνού «Μεταξύ Πειραιώς και Νεαπολέως» και «Αι Συνέπεια της Παλαιάς Ιστορίας». The accuracy of A. Huxley’s prophecies as predicted in Brave New World in terms of the technological progress and social behavior of the 1990’s. “Romeo and Juliet”: A comparison between Franco Zeffirelli”s and Baz Luhrman’s film Versions, in terms of messages conveyed and effect on the audience. The portrayal of Satan in Paradise Lost by Milton as hero. The Effects of Tourism on the Balance of Payments Account of Greece during the Period 1990-1996. Exports of Primaries for Brazil: A Reliable Strategy for Economic Development? Gold: the Engine for the Continued Growth and Transformation of the South African Economy. What should MCI SA do to maintain its turnover and further increase it in medium term, namely in the next three years: from 2004 up to 2007? How should/could PLM Shipping Limited prepare to cope with potential hazard so as to minimize environmental and company damage? How should Karelia Tobacco Company improve its performance and gain an extra 3% domestic market in 3 years. The Role of School Environment as a Social Factor in Affecting Teenagers’ Susceptibility to Drug Abuse. Eyewitness Memory: an investigation of the effect of “leading questions” on the accuracy of eyewitness memory. Does marital conflict or divorce relate to the offspring’s marital quality? Can George M. Gohan’s « Over There » and Ernest Hemmingway‘s « For Whom the Bell Tolls » be seen as historically reliable sources? To what extent was WWII responsible for the outbreak of civil war in Yugoslavia in 1941? To what extent did Liubov Popova’s Constructivist work of 1918-1923 promote the ideals of Russian Revolution? Time Variation of Frequency Spectrum of a Guitar String. Variation of the resistance of a wire under tensile stress. Measuring and decreasing the reverberation of sound in a classroom. The Thermal Stability of Olive Oil. Bacterial Growth in Pasteurized and Sterilized Milk at Ultra High Temperatures (UHT Milk) of Varying Lipid Concentrations. The effects of different dosages of radiation on the germination and growth of mung and rye seeds. The Buffon Needle test: A new evaluator of Pseudo-Random Number Algorithms. An application of the travelling Salesman Problem. The ancient history of pi. How Chanel influenced women’s fashion from the Victorian to the modern age. What effects have the previous restoration attempts had on the Acropolis and what effects will the current restoration have for the future of one of the world’s greatest monuments? How can matter turn into spirit? A study of Mary Samoli’s wreaths. The Creativity, Action and Service (CAS) component of the International Baccalaureate Diploma Program at Geitonas School takes seriously the importance of life outside of the traditional classroom and the world of scholarship. It provides a significant and invaluable counterbalance to the rigors of an extremely challenging academic program. The emphasis is on the creative, physical, and social development of our candidates as they are shaped by their own experiences. The goal of educating the whole person and fostering more caring and socially responsible attitudes comes alive in a real way when students reach beyond themselves, their classroom environment and traditional academic learning. The educational benefits of CAS can be seen not only within Geitonas School but also within the local, national and international communities through involvement in wide range of environmental and social service endeavors. Students are thus sharing experiences with people of different social, economic or racial backgrounds, the physically challenged, and the elderly. Our CAS program has been designed to challenge DP candidates to develop a value system by which they are enabled to enhance their personal growth. The development of a spirit of open-mindedness’, lifelong learning urge, discovery and self-reliance are the foundation of our program. Involvement inspires a sense of responsibility towards all members of the community. It encourages the development of attitudes and traits that will be respected by others, such as determination, commitment, initiative, and empathy. Creative and physical activities offer opportunities for fun and enjoyment at a time which our IB students are full of stress and uncertainty. Through the interaction of the three interwoven elements of CAS (creativity, action, and service) we are promoting the education of the whole person. Thus the student is enabled to recognize that there are many opportunities in life away from formal academic study that enable them to grow in their knowledge of life, themselves and others. Experiential learning emphasizes learning by doing real tasks that have real consequences and then reflecting on these experiences The process of doing and reflecting on the doing provides our students with an excellent opportunity to extend what they have learned within the context of their academic learning within the classroom to a form of service, such as applying principles from a science curriculum to the environment, or applying technology assistance in the creation and design a web site for an NGO dealing with problem of illegal trafficking of women from third world countries. The creation of a website for participants in a cross cultural youth peace forum involving teenagers from Greece , Turkey, Cyprus and the subsequent organization of a teen peace organization under the guise of a national NGO incorporates all three aspects of the CAS component. At Geitonas School service activities are undertaken gradually and adapted appropriately to the circumstances and take into account the students’ aptitudes, preferences, and career goals. These experiences are never designed to shock students as this would be counter to the educational aims of the CAS program as such. Activities are designed to be rewarding and enrich all involved. The creativity, action and service component is designed to build self-esteem, self-confidence, autonomy, empathy and self-reliance. As a result of participation in C.A.S endeavors, DP candidates undertake citizenship roles at a local, national & international level. Our faculty, which is actively involved into the planning and implementation of the activities, regards CAS instrumental in the shaping of a unique learning environment for all those who wish to make learning a lifelong experience. It is through CAS that teachers also become learners, innovators, and facilitators in developing the full range of attributes associated with academic excellence and personal development. CAS challenges and stimulates curiosity and inquisitiveness in order to foster a spirit of discovery, collaboration and enjoyment of learning. Group 1 courses are intended to meet the requirements of students whose Language A is their native (i.e strongest or first language) language, while taking into account that many students electing to take these courses will have complex language profiles and may be bilingual or trilingual. To enable students to deepen their understanding of the literature of their mother tongue culture, 45at least different languages in group 1 are regularly available for selection. While it is recommended that students choosing this option have had experience of writing critical essays about texts, not having done so is not necessarily a reason for exclusion. While the Literature and the Language and Literature courses in Group 1 offer a different focus, they are both designed to support future academic study by developing high levels of language competence and communication skills as well as social, aesthetic and cultural literacy. Literature plays a central role in the courses which aim to support lifelong learning through engaging students as actively as possible with the texts and language they study. Both courses include the study of world literature texts (those originally written in a language other than the language studied). This affords much scope for the exchange of ideas about cultural diversity and related ideas. The students’ own experiences in this field become a significant component in the kinds of inquiry undertaken. Language Literature Course The Literature syllabus is comprised of four main sections, each of which is examined in different ways. Students study a range of texts in different genres and from different regions and periods, chosen by the class teacher from a prescribed list. Work in the classroom encompasses a variety of oral, written, creative and analytical activities, designed to encourage students to respond to literary texts in different ways and to fully appreciate the value of literature in the way it can make imaginative sense of the world. Group 2 consists of two modern (Language B and ab initio) and two classical (classical Greek and Latin) courses. The underlying principle of requiring the study of a second language is to promote cultural understanding through language and, in this case, an understanding of other cultures through the study of other languages. Language B is a foreign language course for students already familiar with the language. The underlying principle of requiring the study of a second language is to promote cultural understanding through language and, in this case, an understanding of other cultures through the study of other languages. Our school offers the Language B course in three languages: English, French and German, each at two levels (High and Standard) depending on the students’ interests, future course orientation and degree of challenge that they are willing to accept. The Language B course is a language acquisition course that aims at enforcing the student’s ability to communicate in a social environment where the target language is spoken. The main emphasis of the modern language courses is on language acquisition and usage, from the comparatively elementary, practical usage at ab initio level, to a broad spectrum designed to provide access to all students, regardless their level of linguistic ability. In certain cases arrangements may be made for other languages, depending on the student's particular interest and his/her knowledge of the particular language. Students beginning a language at Standard Level must have a basic knowledge of the grammar and must be able to write and discuss, simply but correctly, on everyday subjects. In all Group 2 courses the student's grade is based on a written examination as well as on formal oral tests (assessed internally but monitored externally). In most university systems, the examination in Language B at Higher Level confirms that the student is equipped to study in institutions in which that language is the teaching language. For example, a Greek student who chooses English as Language B at HL will be able to study at a British university. The sheer majority of the UK universities accept DP students with English B (because the student has taken the whole Diploma program in the English language). The language ab initio courses are language learning courses for beginners, designed to be followed over two years by students who have no previous experience of learning that language. The main focus of the courses is on the acquisition of language required for purposes and situations usual in everyday social interaction. Language ab initio courses are available only at standard level and they may be offered at our school only upon request. The nine subjects offered in this group, all provide for the development of a critical appreciation of human experience and behaviour, the varieties of physical, economic and social environments that people inhabit, and the history of social and cultural institutions. The subjects are designed to foster in students the capacity to identify, to analyse critically and to evaluate theories, concepts and arguments relating to the nature and activities of individuals and societies. Students come to an appreciation of the way in which learning is relevant to both the culture in which a student lives, and the culture of other societies. The students are encouraged to recognize that human attitudes and opinions are widely diverse and to understand that a study of society requires appreciation of such diversity. the development in the candidate of the capacity to identify, to analyze critically and to evaluate theories, concepts and arguments concerning the nature and activities of the individual and society. to recognize that the subject matter of the disciplines in this group is contestable and that their study requires the toleration of uncertainty. The following subjects are on offer at our school: Economics, Psychology, History, Business & Management, Philosophy. The five experimental sciences offered in this group, provide opportunities for scientific exploration and creativity within global contexts. Each subject contains a body of knowledge, methods and techniques which students are required to learn and apply. In their application of scientific method, students develop an ability to analyse, evaluate and synthesize scientific information. Out of the five sciences in this group Biology, Chemistry, Physics and Computer Science are on offer at our school. A compulsory group 4 project encourages students to appreciate the environmental, social and ethical implications of science. The exercise is a collaborative experience where the emphasis is on the processes involved in scientific investigation rather than the products of such investigation. Furthermore, the collaboration is interdisciplinary: within the sciences’ groups students analyse a topic or problem which can be investigated in each of the sciences offered by the school, and they practise their experimental and investigative skills. By this means, an understanding of the relationships between scientific disciplines and the overarching nature of the scientific method is encouraged, and an opportunity to explore scientific solutions to global questions is provided. develop an appreciation of possibilities and limitations associated with science and scientists. A common curriculum model applies to all group 4 modules. This model offers a parallel structure at both higher and standard level, whereby a core of material is studied by all students, and this is supplemented by the study of options. At standard level the core makes up about 60% of the program, while at higher level the core is 73%. At standard level, students have to choose three options of 22 hours study each, while at higher level they must choose two options of 28 hours each. and those which can be taken in part by SL students (core) and as a whole by HL students (core + extension)(OPT-SL/HL). This model provides flexibility to schools and teachers, both with regard to choice of syllabus content within the program, and with regard to the organization of classes within the school. The core material taken by SL students forms a sub-set of the HL program. Similarly, at least one of the SL specific options is taken from HL core material. This has been done to facilitate the situation for those teachers who are compelled to teach SL and HL students together, for at least part of the time. This program structure should not be taken to imply that it is intended that SL and HL students are taught together. All students are required to spend at least 25% of their teaching time following an internally assessed scheme of practical/investigative work, related to all aspects of the program, including the options. The Group 4 Project, which is a common component for all group 4 syllabi, makes up 15 hours of the internally assessed scheme of practical work. Because mathematics enters people’s daily lives in so many ways, it is a compulsory area of study for every Diploma Programme student. But because each student has different needs, interests and abilities, and will use mathematics to serve different purposes, a variety of courses is offered. The mathematics subjects aim to enable students to develop mathematical knowledge, concepts and principles, to develop logical, critical and creative thinking, and to employ and refine their powers of abstraction and generalization. Students are encouraged to appreciate the international dimensions of mathematics and the multiplicity of its cultural and historical perspectives; they are also encouraged to engage in mathematical pursuits, and to develop an appreciation of the beauty, power and practicality of the discipline. Four of the five subjects in this group (mathematics HL, mathematics SL, mathematical studies SL and further mathematics SL), are designed to cater for a range of mathematical ability, and to provide the mathematical support for the students’ other subjects (such as economics, business and management, and the experimental sciences) and their university and career aspirations. The fifth subject offered in the group is computer science, but this must be studied in addition to a mathematics subject if selected. This subject aims to develop an understanding of the range and organization of computer systems, including software, data and hardware, and of the use of computers in a variety of disciplines, applications and contexts. The subjects in group 6, are interpretative in approach and allow for significant choice of content. This feature, which is appreciated by teachers, allows a high degree of adaptability to different cultural contexts, and to the strengths and interests of teachers and their students. The emphasis in all the subjects is on creativity: the making of art, the making of music and the making of theatre in the context of disciplined, practical research into the relevant genres. Historically, arts assessments in the Diploma Programme emphasized imaginative and creative thinking and expression, in both subject matter and technique. More recently, it was recognized that this was a western-orientated bias. In many non-western cultures, 16- to 19-year-olds are taught to imitate the ideas and to practise the skills of the masters. The western-orientated assessment criteria rewarded the students who took risks, experimented, and were adventurous; students from many non-western cultures were discouraged from risk-taking and experimenting until they had perfected their skills. Importantly, the syllabuses and assessments of the current arts subjects have removed much of this bias, and now reflect an eclectic attempt to combine contrasting aesthetics and forms of assessment from around the world. A new course in film has now also been introduced to group 6, made possible because the technology required for the making of film images has become less complex and expensive, and more readily accessible to schools. Developments in digital image recording and transmission promise to make film images even more available through everyday computer technology in the very near future. Those who have a particular interest not included in Groups 1-5 such as Visual Arts may choose this course from Group 6. However, one of the strong points of the program is that it offers those students intending to continue their studies in the sciences, for instance, the opportunity of an extensive involvement in art. This is also of benefit to students wishing to go on to study architecture - a field that is both an art and a science.